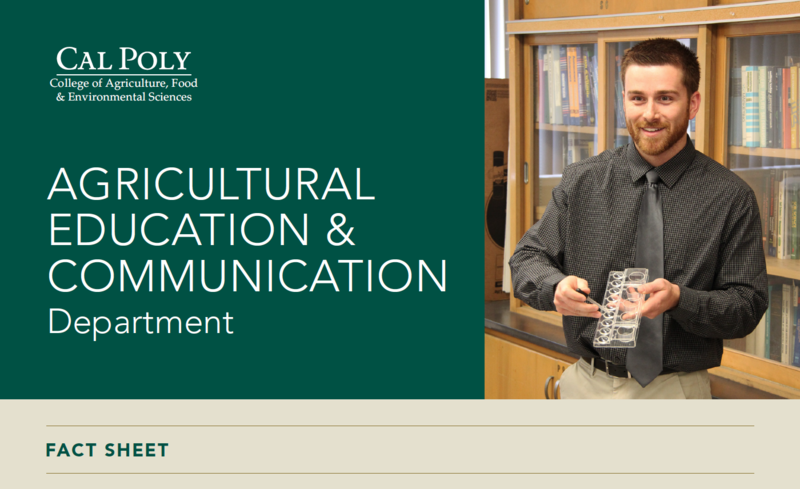 If you are excited about agriculture and want to let others know about it, Agricultural Education and Communication is right for you. Our graduates come from a wide variety of backgrounds and share a passion for communication and teaching. Some go on to teach students about the application of science, management, leadership and technology of food, fiber and natural resource systems. Others enter the workplace, sought after by the agriculture industry who look to our graduates to tell the story of agriculture and to help shape public opinion about California’s most important industry. Our mission is to contribute to the improvement of agricultural instruction in the state of California and prepare agricultural communicators who will promote agriculture and serve the needs of the agriculture industry. We are proud of our long history of leadership and service to the college, the university, the agriculture industry and the agricultural education profession in California. Cal Poly’s Learn by Doing philosophy genuinely prepared me for my marketing internship at the U.S.D.A.